This weeks Gallery is Noses: There are 14 types of noses apparently! My paternal Grandmother had a huge nose and my father inherited about half of it. I was a little luckier and got slightly less again. But hey, big is better right?! As my father got more ill his nose was mostly red and then purple. It didn't look at all strange or odd. It totally fitted his rugged face and was just part of who he was. After he died I went to see him laid out. The undertakers had taken it upon themselves to make his nose look normal coloured. They had done a grand job, it didn't look at all made up, you would never have known except it just wasn't dad. I looked and looked and just wanted to rub it off. I didn't of course, but I can still remember how odd it looked as clear as anything all these years later. I have a scar on the top of my nose. I've struggled to find a photo that shows it, because I cover it in makeup or air brush it usually. 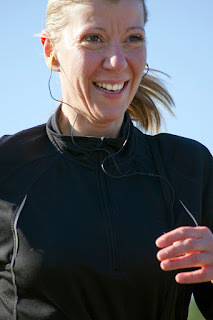 An old running photo, no makeup and no airbrush and you still really have to zoom to see it. It probably just looks like a little sunburn mark perhaps to you or a scratch but I hate it. Nobody else probably notices it. But when I look in the mirror I see it first. I see it and I get an immediate and sickening reminder of how it got there. The day it happened. Funny old thing, noses. 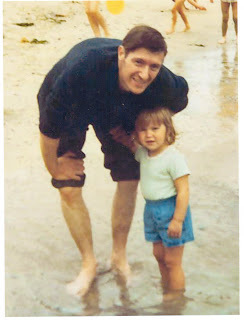 My first thought was my fathers scarred and coloured nose and yet to me it was just perfect the way it was. My second thought was of my own scar that it much bigger on the inside of me than it ever is on the outside and I wish it gone. Q: Just tell me one thing. Is her nose as pretty as mine? E: Oh, no, no.. ma'm. Q: Oh good, because otherwise I would have cut it off. And then you would have to marry someone without a nose and that wouldn't be very nice, would it? Q: Imagine the mess when she's got a cold! Yuck!